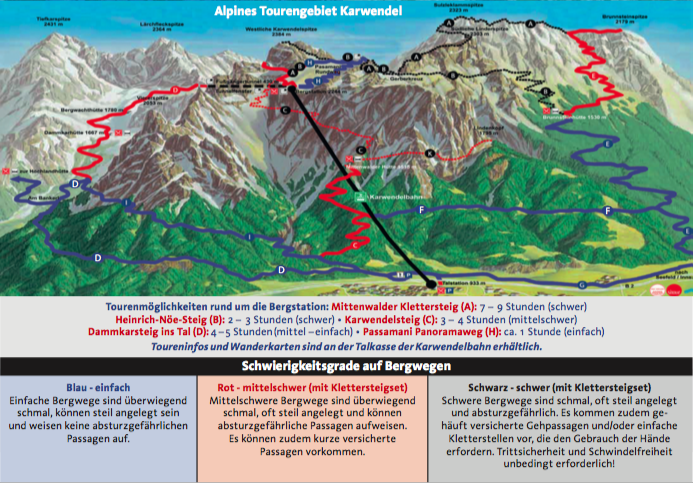 The mountain station of the Karwendelbahn is a perfect starting point for tours in the northern Karwendelrange. You can start several hikes – from leisurely to sporty, from one-hour to several day-tours. The Mittenwald cabin, Dammkar cabin and Brunnstein cabin are along the way. After a successful hike you can sit back and relax at the mountain restaurant or at the “Dammkarstadl” at the mountain station. Small hint: If you’d like to give your legs a rest, take the hike through the “Dammkar” to the mountain station and take the gondola into the valley. Family friendly and easy to walk in about an hour is the Panorama circular route. Another tour takes frequent hikers in about four hours through rugged terrain in the “Dammkar” into the valley. This way leads you through a skiers tunnel, above stone fields and the Dammkar cabin with a fascinating cliff view. If you’re free from giddiness you can enjoy a fantastic view from the via ferrata. It’s doable in about seven to nine hours, even with older kids, but only with hiking gear! Your hike leads you along the Bavarian-Tyrolean boarder. Starting point is the mountain station. Please always wear secure shoes and check the weather forecast before you start your hike.